Pippa Middleton has stepped into the spotlight after a considerable amount of time in her sister, Kate Middleton’s shadows. And she’s done so with aplomb thanks to the arrival of her debut book, Celebrate. IS PIPPA MIDDLETON DATING MADE IN CHELSEA STAR’S BROTHER? 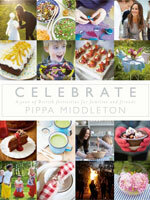 The hottest happening in the literary world since Fifty Shades of Grey is Pippa Middleton’s Celebrate and it’s a perfectly poised guide to entertaining featuring recipes fit for festivities throughout the year as well as craft ideas and tips. To mark Celebrate’s arrival, we’ve selected our favourite recipes from the book so you can create some Middleton magic in your own home. And who knows, maybe even bake your way to your own book deal…. Already tried one of Pippa Middleton’s recipes? Let us know what you think of her book below.